Voting begins tonight at 10 PM. You can go to the McCalls Website and vote once per day per computer. So, go and cast your votes for your favorite. (Look for mine, Anemone). 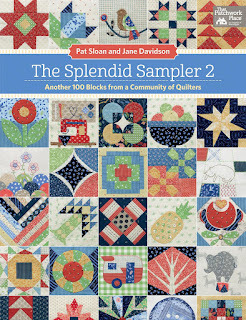 As many of you may know I was fortunate enough to be able to participate in the Splendid Sampler 2 organized by Pat Sloan and Jane Davidson. I was very excited when asked to participate. I love Foundation Paper Piecing and of course I had to use that technique for my block. The block is named Betty’s Bloom in remembrance of Betty Blue, my first Jack Russell. I had her as a puppy and she was the start of 3 Dog Design. I love all aspects of creating from designing to sewing but nothing is better that when you can share your work with friends. And it's even more fun when you can share a great bottle of wine to relax and enjoy the company. I wanted to try using the block on its own in a small wall hanging and wanted to see what it would look like in all solids. The results was a nice modern interpretation of the design. Another idea would be to alternate Betty's Bloom with a simple block. Join us on our next cruise to Alaska. Welcome to the first day of the Blog Tour and thank you for taking a pit stop at my blog. I am very excited to have my block 'Saffy's Star' appear in this issue. To quote a phrase - "It's been a long and winding road to get here." 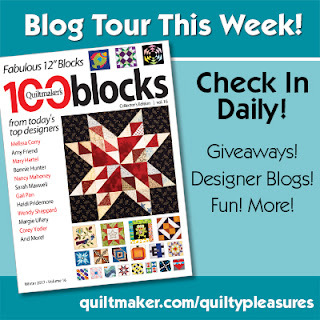 I originally created this block several years ago when I was designing quilts for my book "Amish-Inspired Quilts for Today's Home" along with several other blocks that I did not use. For the block that appears in the magazine, I used Fabrics by Alison Glass for Andover Fabrics. I chose fabrics in Magenta, Blue and Gray for the background. Below is my original concept. Matt comes to 3 Dog Design Company from a diverse background combining 20 years of retail, design, and marketing specializing in visual, buying and management. His background includes working for companies such as Nebraska Furniture Mart, Saks 5th Avenue, and a division of the Home Depot; Home Decorators Collection. 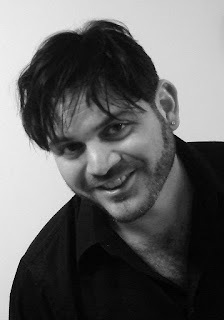 He earned his way into the retail corporate realm serving as the Visual Merchandising Manager - Corporate Officer with Home Decorators Collection based out of St. Louis in 2008. Along his journey, he has collaborated with various designers; Martha Stewart, Jaclyn Smith, HGTV, and David Bromstad from Design Star. In addition, he has owned two of his own interior design and antique businesses, MR Interiors and Classic Finds, Inc.
Matt is a Missouri Western State University graduate, who has worked all over the U.S. with these various entities. He relocated back to the St. Joseph area after 20 years with his two Chihuahuas, Roscoe and Gypsy.